For those who have just bought their first Windows 8 or Windows 8.1 PC or laptop, one of the major problems you will face is to find the start menu. Dedicated in making the users commit to the start screen developed by Microsoft, once you click the button which somewhat looks that start menu button, you will be surprised with a start screen which covers your whole PC screen instead of an organized menu like in that of Windows 7, XP or Vista. However, with the advent of the Windows 10 looming up, Microsoft finally decides to right the wrong. We have utilized this article in letting you know about the various methods as to how you can bring back the start menu in Windows 8. You can convert the start menu into a toolbar to access all your programs. You can use a third party add-on to get back the Windows 8 start menu. We will give you a detailed view of both the processes. This is the first method by which you can get back to the start menu on your Windows 8. Just follow the following steps to achieve your goal. First, make sure that you have enabled the “show hidden files” option on your PC. Go to the “Taskbar” on your PC screen and right click on it. This will provide you with a number of options from which select the “Toolbar” option and select “New Toolbar”. Now, you need to browse and find C:\Program Data\Microsoft\Windows and click the “Select Folder” option once you have arrived at the “Start Menu”. Completion of these steps will let you have a new Start Menu folder in the “Programs” folder from where you can access all the files and folders just like you did in case of the Start Menu in other Windows Version. The second method by which you can get back to the start menu in your Windows 8 start up page is by installing compatible add-ons which will allow you to access the same. Here is a list of such add-ons which you can use. Once you have downloaded Start Menu Reviver 2 on your Windows 8 PC, you can now access the newer and more sophisticated version of start menu. This add-on is touch friendly and adapts the Windows 8 style so that it doesn’t look like an outsider. It allows you to browse the start menu just like the other Windows versions. Available for just $ 3, StartIsBack gives you back the look and feel of Windows 7. If you are a huge fan of the start menu in the predecessor of the Windows 8 you can get an exact replica of it on your Windows 8 or Windows 8.1. You can even try out a free trial version of the same foe a month before buying the complete version of the same for a relatively low price. Windows 8 Start Menu is developed by SweetLabs and provides you with a start menu which is sleek and effective at the same time. Once installed on your Windows 8, Windows 8 Start Menu will allow you to access all your programs, documents, pictures and videos via the startup menu like in the previous Windows versions. 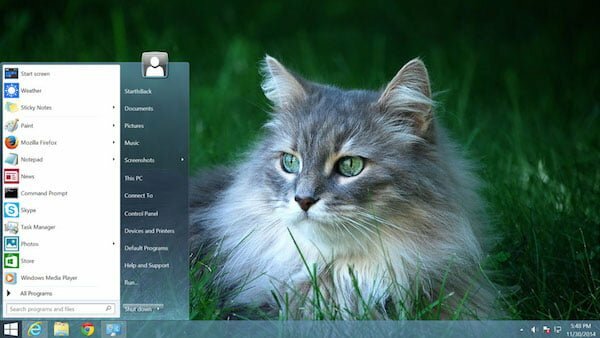 Start 8 is one of those completely free add-ons which offer the puzzled users with a similar start menu and is exclusively for Windows 8. For all the new users of the Windows 8, this is a perfect solution as it allows you to access the start menu with great ease along with fast searching options, complete view of all the hidden files and folders. It also allows easy customization of the start menu. We hope that these options have helped you enough to get back the start menu on your Windows 8 or Windows 8.1 PC or laptop. You can select any of the above options according to your convenience to access the start menu.